The kitchen is the heart of the home, bringing your family together for Christmas, birthdays and Mum’s best Sunday dinner so let’s treat it with the respect it deserves and find a worktop that perfectly matches your kitchen’s style. So how do know what the ideal kitchen worktop is for you? Well, first of all you need to ask yourself some questions. What is your budget? Kitchen worktops can fit most budgets, but you don’t really want to be scrimping on such a focal point so make sure you can afford exactly what you want. Do I have enough time for the installation? We all lead busy lives, make sure you have the time for your old worktops to be ripped out and replaced. Will I hire a professional to install it or do it myself? Depending on your own level of skill and the type of worktop you choose, it may be possible for you to fit your own. However, make sure you know exactly what you’re doing before you start cutting anything up! Is there a need for a heat resistant worktop in my kitchen? Sure, we’ve all put a hot pan down only to find out that it’s left a mark on our work surface. If you want something that is resistant to heat, make sure you choose the right worktop. Am I good with cleaning and wiping up any spills immediately? Some worktops can be easily damaged through spills, whereas others take a spill in their stride. Choose wisely or it could end up costing you later! How much area have I dedicated for the worktop? Most worktops have a maximum length. If you want your worktop to be in one piece, without any visible joins, make sure you’ve correctly measured your space. What colour and texture do I want? There are almost unlimited choices when it comes to colour and texture, so finding the right one can be a little daunting. Find your style and find something that matches perfectly. Once you have answers to these questions, you’ll be able to understand the different worktop materials and make the right decision. Let’s have a look at the different types of worktops that you can choose from. Granite is a highly popular stone choice for worktops. It’s stylish, luxurious and adds a quality feel to the kitchen. It’s also durable and functional — two of the most important qualities you want in a worktop. 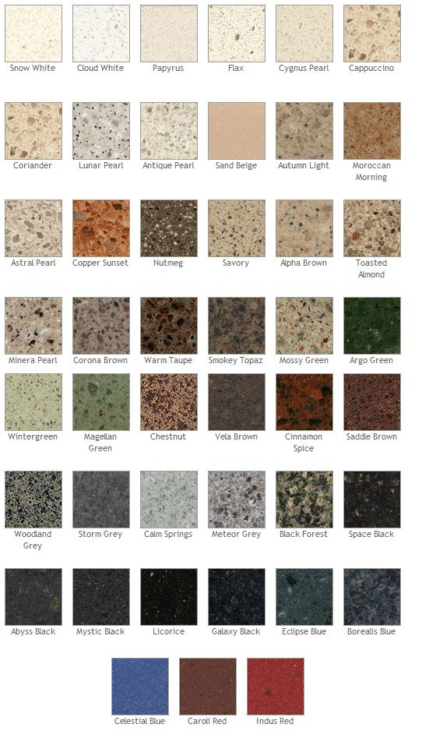 Since granite is a natural stone, you can choose from many shades and patterns to match your kitchen’s colour scheme. Whether your kitchen is modern or traditional, you will be able to find something in granite that looks both unique and appealing. – They save you money because they’re long-lasting and don’t depreciate in value. – They’re strong enough to take the heat of anything hot. – They’re not only hygienic, but also super-easy to clean. – They can’t be repaired if they get damaged. – They’re heavy and require full support from the cabinets after fitting. – They’re porous and need to be sealed at least once in two years. Maintenance: Clean with warm water and detergent. Avoid acidic cleaners. Quartz, although a man-made stone, has the durability of natural stone. One of the best things about quartz is that it’s scratch-proof and can easily withstand chipping, which makes it low-maintenance. Quartz has a consistent stone quality, which gives your worktop a more finished look and feel. Also, buying a quartz worktop helps in contributing to the green revolution since it contains waste materials. – They can be customised according to your preference due to the wide range of colours and textures available. – They’re non-porous and therefore don’t require sealing, which makes them highly stain resistant. – They contain 93 percent natural quartz stone and 7 percent resin bender, which makes them strong and resilient. – They can’t handle too much heat. – They’re expensive compared to their other counterparts. Besides the upfront costs, you’ll have to pay more for a professional installation. – They don’t have a very natural look but a more contemporary one. Maintenance: Use simple soap and water to wipe clean. One of the reasons many people choose to go for a glass worktop is it helps them make a modern design statement. These worktops are sleek, glossy and look super-stylish. What’s more, glass worktops come in a ton of different colours and unique designs. For example, cracked glass worktops are a popular choice with homeowners. Glass worktops can also be heavily customised according to your preferences. – They are very durable, as well as being both heat and water resistant. – They can be cut to the exact size/shape needed to fit in the kitchen’s design and also come in colours that don’t fade. – They don’t allow the build-up of stain or mould, making them hygienic. – Despite their strength, they can crack if excessive weight is placed on the corners. – The surface can be damaged if highly acidic food content (ex: tomato) or harsh cleaners are left standing for too long. – They can be fairly heavy and expensive when compared to granite and quartz. Corian is a popular brand in the solid surface worktop market. Solid surface material is produced by mixing plastic resin and bauxite pigments. Once created, it is bonded to a timber substrate to create a solid surface worktop. When it comes to matching the worktop to the kitchen’s theme or design, Corian does a great job. Since it’s not a natural material, you can get it one large sheet to create a “one sheet” worktop that has zero joints or seams. – They don’t have chipboard core, which makes them highly design flexible. – They’re non-porous, making them hygienic and dirt/bacteria resistant. Plus there are no joints to trap germs. – Any small damages such as minor scratches and marks can be easily removed with regular cleaning products. – Even after regular care, they collect small abrasions and scratches with time, which lowers the satin finish they come with. – Although they are flexible in terms of design, they’re expensive compared to other solid surface worktops. – Since they’re made of type of plastic and not stone, they’re less heat resistant than granite and quartz. Maximum Length: No maximum length. Maintenance: Clean with a damp cloth. If required, use a regular cleaning spray and a kitchen scouring pad. Post-cleaning, rinse with water and dry with a towel. You can also use a regular degreaser to remove any grease stains. A solid wood worktop has the ability to fully transform your kitchen. Whether you have a traditional kitchen or a modern one, these worktops can add natural beauty to the place. For achieving a traditional look, maple, oak and beech work well. For a slightly more exotic feel, Wenge, bamboo and Iroko are excellent choices. What makes wooden worktops unique is they develop a character and an even greater aesthetic appeal over time. – They improve with age and, with proper maintenance, can be kept in a good condition for a long time. – They are solid, which means you can sand away any accidental damage. – They’re naturally resistant to germs and bacteria. – They’re a cheaper alternative but require regular maintenance to keep them in good condition. – They need to be oiled regularly to avoid permanent damage caused by water. – They can’t withstand heat from hot pans and dishes. Also, you can’t cut anything directly on the surface. Maintenance: Remove any stains and burns by carefully sanding with grain. You can prevent the wood from drying out by annually applying a thin coating of oil. Laminate worktops are made of high density chipboard and then coated with plastic laminate. Currently, they are the most popular choice for worktops in the UK. They come in various sizes, colours and designs to help you achieve your desired look. There is an array of options available to choose from such as matt, high gloss, honed, riven, standard and riverwash. There are also laminate worktops that mimic other effects such as granite and wood. – They’re affordable and can easily fit within your budget. – Their waterproof surface makes them easy to clean in case of a spill. – They can be easily installed without the help of a professional. – They can be damaged by sharp or heavy objects. – Hot pans can leave scorch marks on the surface. – They don’t always go well with Belfast sinks or under mounted sinks. Maintenance: Use a mild detergent and a nylon brush for cleaning the surface. As you can see, each type of worktop has its pros and cons, so make sure you know exactly what worktop fits your requirements and lifestyle before you make a purchase. Once you’re done choosing a kitchen worktop, try to hire a professional fitter if you can, because the last thing you want is your expensive worktop to look cheap and low quality. A professional fitter will ensure the worktop is designed, cut and installed perfectly. When is a Kitchen SALE not a SALE? If needed, we will visit your home and offer a survey. Let's get started by visiting the appointments page and choosing the one that suits you. Great! We are here to talk. Set a callback or send a message. or call us on 01227314103.